"Our building uses a variety of materials on the lobby walls. Can these materials be used inside the cabs as well?" 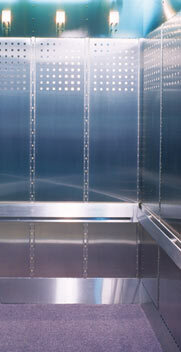 Virtually any type of metal, stone or fabric can be used to decorate an elevator cab interior. The only real restrictions on the use of materials are the various local fire and safety regulations, and of course, the full extent of the designer's imagination. We have the facilities necessary for working with any type of material and our employees have the expertise required for creating a range of custom finishes.